Salvation Army Anti Gay HOAX. The Salvation Army is NOT Anti-Gay! Home → Across America → Salvation Army Anti Gay HOAX. The Salvation Army is NOT Anti-Gay! It’s Christmas time again and the gay smear merchants are back in full regalia to again bash the Salvation Army because …NO GOOD DEED GOES UNPUNISHED. According to the gay folks we spoke to — those involved in charity work — some outspoken and mindless gays who don’t actually donate anything to anyone but themselves — are not happy unless they are causing trouble. Of course they are prodded along by their straight hangers-on who habitually treat gay men like trained seals. They don’t really care about the Salvation Army or its policies. They just want to be seen with socially connected gay guys…geez! My personal feelings aside, the Salvation Army has very little or nothing to do with any anti-gay policy, and simply because someone who volunteers for the organization went on an obscure podcast radio show and made some lunatic fringe comments to perhaps 10 listeners, some annoying gay crusaders have made this staged Facebook “share story”– and it’s accompanying image — their raison d’etre — but it’s a lie — it’s invented crap. Yes, it is true that the Salvation Army is indeed a faction of the old English Methodist community. Their underlying Christian doctrine, however, does not appear to influenced their charitable work in any way. I would imagine that their are some freaks within the organization who say stupid stuff, but what one person says has nothing to do with the overall CHARITABLE foundation of the Salvation Army. Here is a quote from a gay man — Kaylin-Vincente-DuLuissey — a 26-year-old New York socialite who is uber-involved in many charities both in the USA and in Europe. “I knew this absurd story would rise again as soon as Christmas grew closer. Notwithstanding the fact that this was exposed as a hoax years ago, why is this nonsense still circulating? You know what, folks? This gay guy isn’t lying. The Salvation Army doesn’t want gays put to death and they don’t go around trying to find out who’s been naughty or nice. They just give where they are needed and for a long long time they have helped by doling out billions of dollars to EVERYONE. If, however, you were to Google this “kill the gay thing” you will find a lot of “TRUTH” on the net because the crazy people behind this have bombarded the internet with lies. It’s amazing how this stupid stuff spreads like a cancer — mainly because of Facebook, and we all know how I feel about “shared” stuff on facebook. Here is more from Kaylin-Vincente DuLuissey, the gay New York socialite who rants against his own peers. “That is typical behavior of organizations in the past like Act Up and Queer Nation and so many other ragged and politically moronic websites today like Media Matters and The Daily Kos, and whatever, but at the height of the AIDS epidemic and still to this very moment, the Salvation Army in the USA and Europe did more to help than did any GAY organization…that’s for certain. It is indeed true that the Salvation Army gives a whole lot of money to gay causes — and they’ve been doing that for a long time. They might not know that a cause is “gay” but they don’t seem to care. If an AIDS hospice needs a blood drive or meds money, they give it. End of story. The same applies to Catholic Charities ( another target of the bashers) who nearly bankrupted their coffers of blood and money and meds with endless giving — 98 cents for every dollar delivered was given to the sick and needy. Don’t wait for Jimmy Carter and Habitat For Humanity to help you because about 100% of their donations go to their big salaries — they might even be worse than the ASPCA or The American Cancer Society. Really? Yes, really. Hey, TheDamienZone.com is not a spokesman for or against these organizations but we are profoundly averse to stupidity and gullibility. You have to very wary of things that are “shared” on your Facebook page. They are almost always lies or half-truths. Facebook is a giant billboard for every lunatic on the face of the earth. “The sickest part is that the Salvation Army relies on donations and if this stupid urban legend keeps spreading, and even 2% stopped donating, that 2% trickles down to less help for people who need it. This kind of lie is the hallmark of so many people whose gayness is the only thing they own — and this is the kind of propaganda they spread as the traditional season of giving grows closer. I have already seen this popping up on Facebook this week and I knew it was starting all over again. Well, well, well, I hope that striaghtens that out. Maybe the people behind this smear against the Salvation Army could learn something from our rich socialite gay informant. Nah — it’s so much more fun to be mean and bitchy, right? 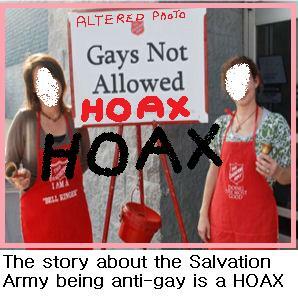 Anti Gay Salvation Army Story - HOAX. Gays Put To Death HOAX. BREAKING BAD Finale TONIGHT -- MAJOR PLOT TWIST -- SEMI-SPOILER. Adam — you just invented a fact. (That means you lied) I love that. It proves that my quest to expose stupidity and dumbness has not been in vain. Thank you for being a moron. How do we know which is the true side?